Until today, nobody has conducted such a fifth force test with an exotic object like a neutron star. "There are two reasons that binary pulsars open up a completely new way of testing for such a fifth force between normal matter and dark matter," says Lijing Shao from the Max Planck Institute for Radio Astronomy (MPIfR) in Bonn, Germany. "First, a neutron star consists of matter which cannot be constructed in a laboratory, many times denser than an atomic nucleus and consisting nearly entirely of neutrons. Moreover, the enormous gravitational fields inside a neutron star, billion times stronger than that of the Sun, could in principle greatly enhance the interaction with dark matter." Is dark matter a source of a yet unknown force in addition to gravity? The mysterious dark matter is little understood and trying to understand its properties is an important challenge in modern physics and astrophysics. 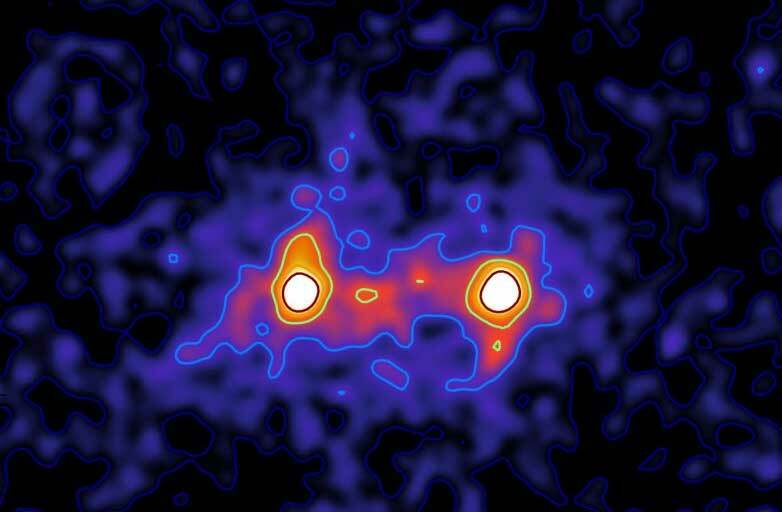 Researchers at the Max Planck Institute for Radio Astronomy in Bonn, Germany, have proposed a new experiment that makes use of super-dense stars to learn more about the interaction of dark matter with standard matter. This experiment already provides some improvement in constraining dark matter properties, but even more progress is promised by explorations in the center of our Milky Way that are underway. Around 1600, Galileo Galilei's experiments brought him to the conclusion that in the gravitational field of the Earth all bodies, independent of their mass and composition feel the same acceleration. Isaac Newton performed pendulum experiments with different materials in order to verify the so-called universality of free fall and reached a precision of 1:1000. More recently, the satellite experiment MICROSCOPE managed to confirm the universality of free fall in the gravitational field of the Earth with a precision of 1:100 trillion. These kind of experiments, however, could only test the universality of free fall towards ordinary matter, like the Earth itself whose composition is dominated by iron (32 percent), oxygen (30 percent), silicon (15 percent) and magnesium (14 percent). On large scales, however, ordinary matter seems to be only a small fraction of matter and energy in the universe. It is believed that the so-called dark matter accounts for about 80 percent of the matter in our universe. Until today, dark matter has not been observed directly. Its presence is only indirectly inferred from various astronomical observations like the rotation of galaxies, the motion of galaxy clusters, and gravitational lenses. The actual nature of dark matter is one of the most prominent questions in modern science. Many physicists believe that dark matter consists of so far undiscovered sub-atomic particles. With the unknown nature of dark matter another important question arises: is gravity the only long-range interaction between normal matter and dark matter? In other words, does matter only feel the space-time curvature caused by dark matter, or is there another force that pulls matter towards dark matter, or maybe even pushes it away and thus reduces the overall attraction between normal matter and dark matter. That would imply a violation of the universality of free fall towards dark matter. This hypothetical force is sometimes labeled as "fifth force," besides the well-known four fundamental interactions in nature (gravitation, electromagnetic & weak interaction, strong interaction). "To make these tests even better, we are busily searching for suitable pulsars near large amounts of expected dark matter," says Michael Kramer, director at MPIfR and head of its "Fundamental Physics in Radio Astronomy" research group. "The ideal place is the galactic centre where we use Effelsberg and other telescopes in the world to have a look as part of our Black Hole Cam project. Once we will have the Square Kilometre Array, we can make those tests super-precise," he concludes.